You will not find this kit any cheaper! We sell to the every day guy rebuilding their own engine, Machine shops all over the world and Garden tractor pullers! We use what we sell!! This is for the K241, K241S, K241AS, K241AQS or any other K241 with any suffix. John Deere, Cub, Case, Sears or ANY TRACTOR with the 10hp Kohler. Also sending FREE directions on how to PROPERLY INSTALL your NEW connecting rod, the number one cause of rebuilt engine failure is improper rod installation. Oil hole goes towards the cam. The head torque is 25 to 30 ft lbs and the rod is 260 inch lb. Anybody can rebuild their Kohler engine in a few hours when you have all the parts. This kit includes the following. 1- Piston, customized to your engine rebuilding needs PISTON COMES IN choice of : Standard. I will send all standard sizes unless you tell me something different. 1- Connecting rod- customized to your engine rebuilding needs CONNECTING ROD COMES IN choice of: Standard and. I will send standard size unless you tell me otherwise. Wrist pin and 2 Clips. I will give you the torque specs. Lb and rod is 260 inch lb. 10hp K 241 These measurments are not for machine shop use. The machine shop MUST have the new piston before they can bore your cylinder. 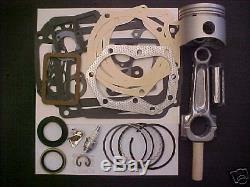 The item "Kohler 10hp K241 ENGINE REBUILD KIT withfree tune up, also fits 10HP m10" is in sale since Sunday, May 12, 2013. This item is in the category "Home & Garden\Yard, Garden & Outdoor Living\Lawn Mowers\Lawn Mower Parts & Accessories". The seller is "bakt4kids" and is located in Wauseon, Ohio. This item can be shipped worldwide.